This is the way to prepare a Martini. Mr Mori-San from Tokio. The Martini glass is about as iconic as it gets when it comes to cocktails. While technically a derivative of the generic cocktail glass, it’s safe to say that this beauty has carved out a place of its own and usurped the original. And it’s not all just good looks—the Martini glass is a functional vessel. First, as with all cocktail glasses, it features a stem. When drinks are served up (that is, stirred or shaken to chill and served without ice) they run the risk of being warmed up by the drinker’s hand, which is prevented by holding the stem of the glass. Second, the wide mouth creates a large surface area for the gin to open up and present its botanical aromas, which is key to this spirit-forward cocktail. First take the martini glass and fill it with ice, then top it with soda water. This will chill the glass quickly. 1) It’s all about the gin, so pick a good one. The martini is a cocktail that makes its spirit base the star of the show. It is not masked by flavor, so you want to make sure you’re using a high quality gin. 2) It’s also about the vermouth. Once opened, vermouth should be kept in the fridge where it will last about three months. If you still have vermouth in the fridge after three months, it is a sign that you don’t make enough martinis. 3) Wet or dry? Less vermouth equals a drier martini, and the more vermouth you add, the wetter the martini. Don’t be afraid of the vermouth though, it’s the marriage between the gin and the vermouth that makes the martini so special. 4) Stirred not shaken. Stirring your martini maintains a silky texture between the vermouth and gin. Ultimately, stirring yields a smoother drink. Add all ingredients to a mixing glass. Add ice and stir until cold. Strain into a chilled cocktail coupe. Garnish with a large lemon twist making sure to squeeze the lemon oils from the skin onto the surface of the martini. Serve with a side of olives. 5) Using bitters to add extra dimension to your martini is encouraged. A couple dashes go a long way. I like to use orange bitters but if there is a flavor you like, add it. I had a martini with cardamom bitters at London’s The Connaught Hotel recently, which complemented the gin and vermouth really well. It was delicious. 6) Keep your stemware chilled. Martinis should be served as chilled as humanly possible, so don’t pour your chilled martini into a warm glass. Keep your cocktail glass in the freezer until serving. 7) Garnish your martini with a twist, and serve olives on the side. The lemon oils from the twist floating on the surface of your martini add a brightness to the drink. 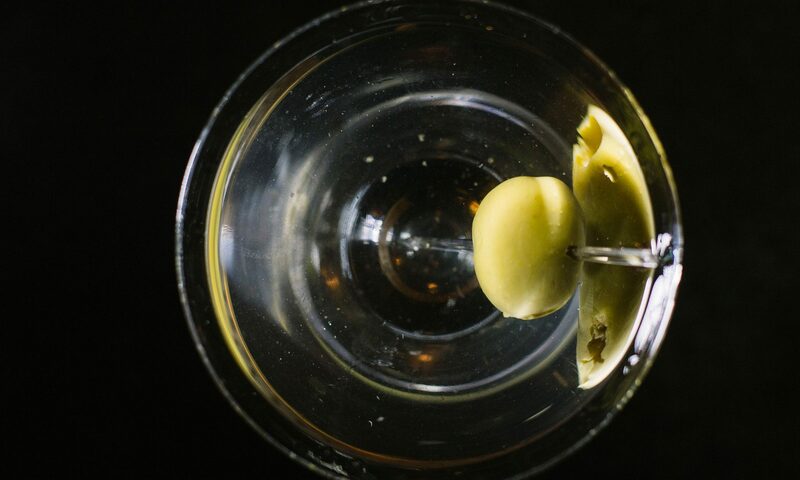 It is not a coincidence that olives go well with martinis. If you look at flavor guides, you will find that olives and juniper (gin’s key ingredient) pair well together, however placing a warm olive into a cold martini isn’t necessary. It only acts as another element to warm your nice chilled drink, and it takes up valuable room in the glass that could have been used for more gin. Serve olives on the side and save yourself the mission of fishing them out of your glass as you enjoy your cocktail. 8) Ice is an important ingredient. Ice cubes that are more that one inch in diameter are good if you have them. Smaller ice dilutes too quickly, watering down your martini too much before it’s chilled. Try not to use ice that has been sitting in your freezer for 17 years. It has freezer burn, and that flavor can affect your martini. 9) It’s okay to drink vodka martinis, they also are delicious. I recommend using less vermouth with a vodka martini, as it can overpower the vodka. 10) The martini is a personal drink. Experiment with different gins, vermouths, and bitters, and try different ratios of vermouth to gin. Find your perfect martini though experimentation. Trust me, you will enjoy the journey, and when you find your favorite way to make a martini, you will be enlightened. How to prepare a vesper Martini, right from the Duke Hotel, where Ian Fleming invented it.